& my guide to How to Build a SSTC! If you are here to learn how to build a SSTC, you have come to the right place! Welcome! The design and construction a Solid State Tesla Coil (a Tesla Coil powered by Transistors instead of a spark gap) is not a trivial task. However, the basic mechanism and workings of a SSTC are not too complicated. 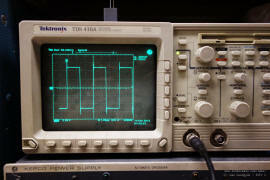 The main challenge in building a SSTC lies with the fact that the builder should have a good understanding & experience with electronics, and have some test equipment (oscilloscope is required) for debugging, which many beginners may not have. There are also several subtle but important things to take note of which are usually difficult to find information about. 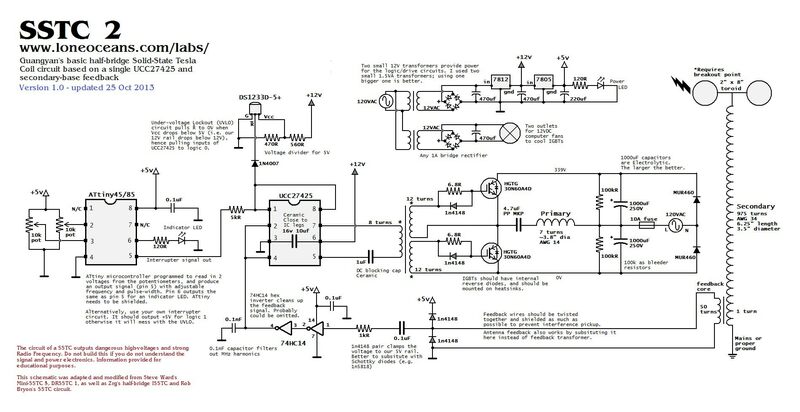 Unlike spark-gap or vacuum tube Tesla Coils, building an SSTC is not as straightforward as copying a schematic. When I began building SSTCs a few years years ago, I found it difficult to find information on how to build one, and what to look out for. Most tesla-coilers, through their own coiling successes and mistakes, have developed an intuitive understanding of the nuances of SSTC construction, and perhaps found them not worthy of specific mention. 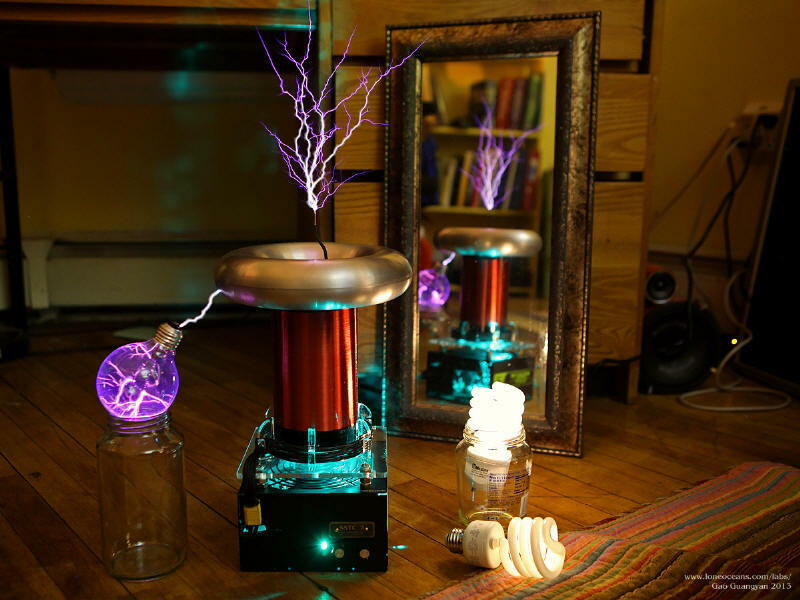 This has led to the motivation to write this page - a basic practical guide to Solid State Tesla Coils. 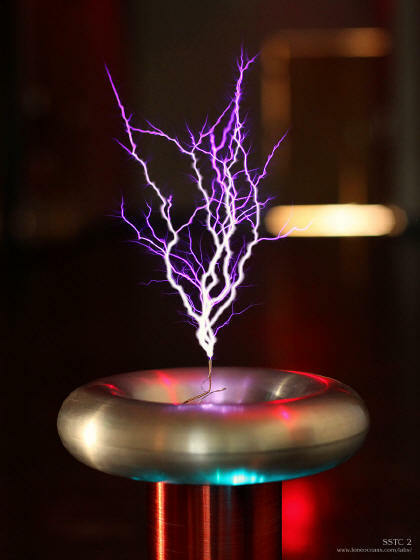 I hope to write a useful and concise document aimed at the budding coiler who has perhaps built a Spark Gap Tesla Coil before, and wishes to move on to transistor Tesla Coils. You might also be interested in my previous Spark Gap Tesla Coils, Tesla Coil 1 and Tesla Coil 2. Also, check out my first SSTC 1, along with my newer DRSSTC 1, DRSSTC 2 and DRSSTC 3 coils - a more powerful variant of the SSTC. Thanks for visiting my page and if you have any questions, wish to share your projects, or feel that my projects have inspired you in one way or another, feel free to email me at loneoceans[at]gmail(dot)com. I'd love to hear about your projects too. Additionally, if you find any mistakes in my write up, feel free to drop me a note! If this page was helpful, feel free to share it with others too! I would appreciate any credit if you choose to use any of the design / code for your own projects. Good luck! Finally, I would like to thank the very many people especially Steve Ward, Bayley and Phillip whom I had very many conversations with and helped me in writing this guide. 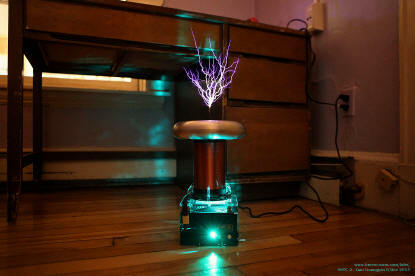 Before I begin, it is good to have a basic understanding of how a Tesla Coil works. For that matter, Wikipedia provides a good narrative and overview. Also, caveat - if any of you more experienced coilers out there finds some mistake in my write up, feel free to notify me for me to fix it! :) Finally, if you are a serious hobbyist who doesn't have an oscilloscope, I would say it is mandatory to buy yourself a scope for you to really grow as an engineer! You can pick an old analog one up cheap for less than $100 these days, and you will really need it for debugging your SSTC. 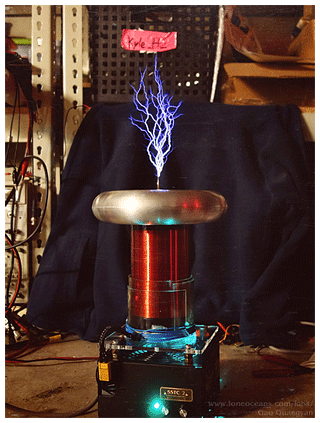 A Tesla Coil is an air-cored resonant transformer capable of generating extremely high voltages. Its construction is relatively straightforward, but the theory is a bit more involved. 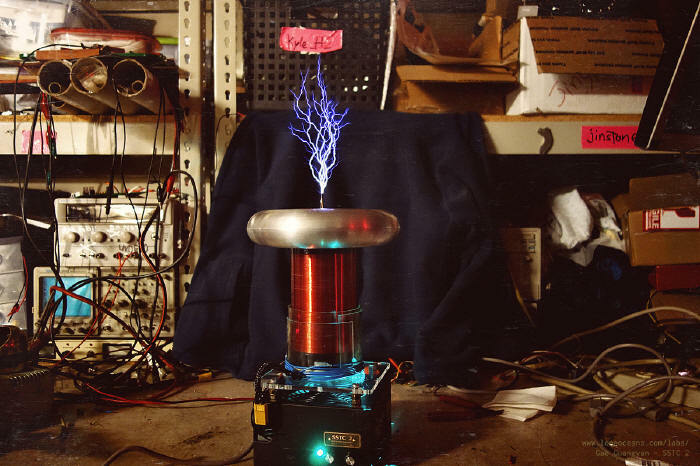 The key concept of a Tesla Coil is its resonant property, where a Resistor-Inductor-Capacitor (RLC) resonant circuit is energized at its resonant frequency, developing very high voltages. 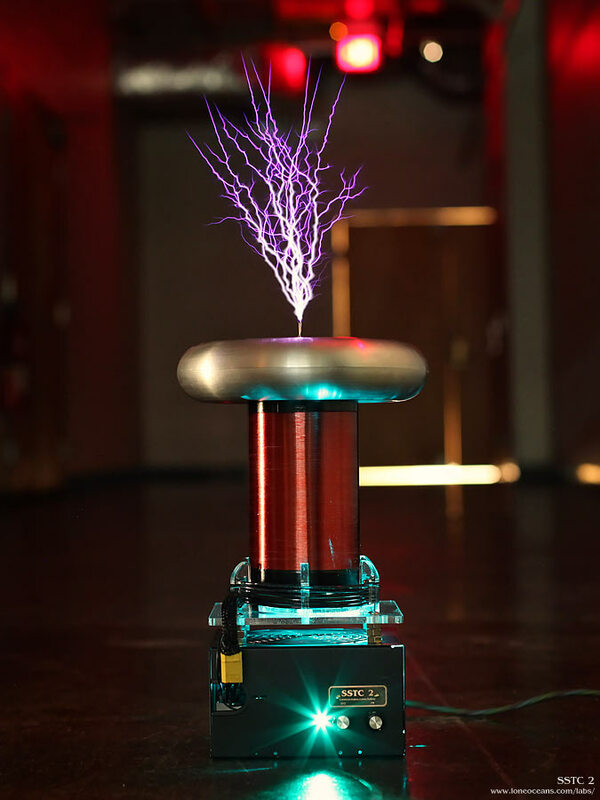 A Tesla Coil consists of two concentric coils which are not electrically connected to each other. The Primary Coil usually consists of a few turns of heavy wire, and has a shape ranging from a solenoid to a flat spiral. This coil is usually connected to some capacitor, forming the Primary LC circuit (if you are unfamiliar with RLC circuits, feel free to browse Wikipedia for a quick introduction). The secondary circuit consists of a long coil of wire, usually having several hundreds to thousands of turns wound on a pipe, and placed concentrically in the middle of the coil. 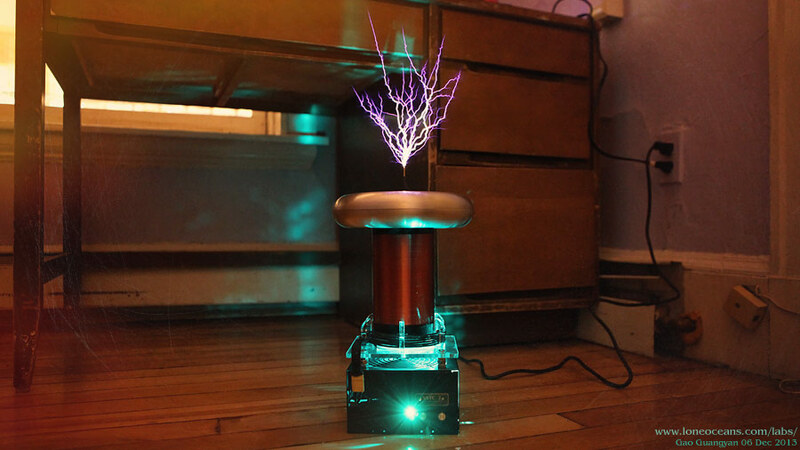 to energize the secondary coil at its resonant frequency. 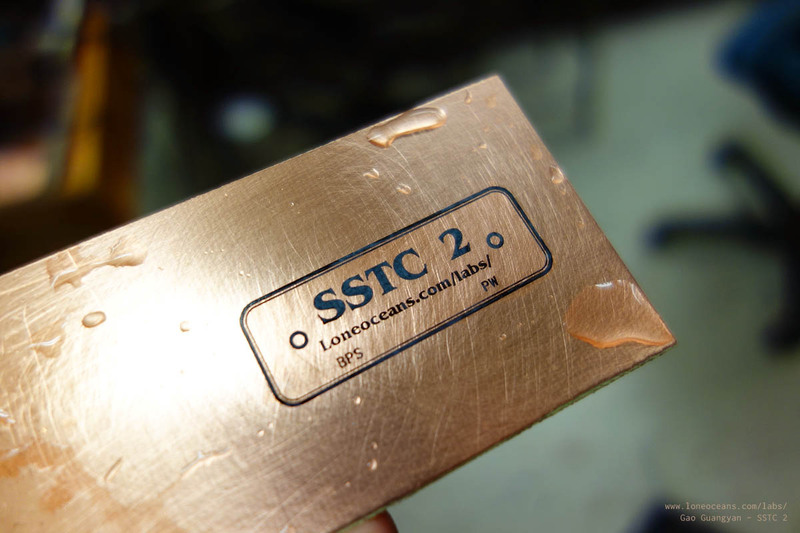 How does a SSTC work? The ratio of L and C also determines the Q-factor of the system (which affects the selectivity, or how narrow its resonant peak is). Think about the resonant frequency as if the circuit was like a swing, which naturally wants to swing at a certain rate. Our goal is then to find a way to drive this primary coil at the secondary's resonant frequency. 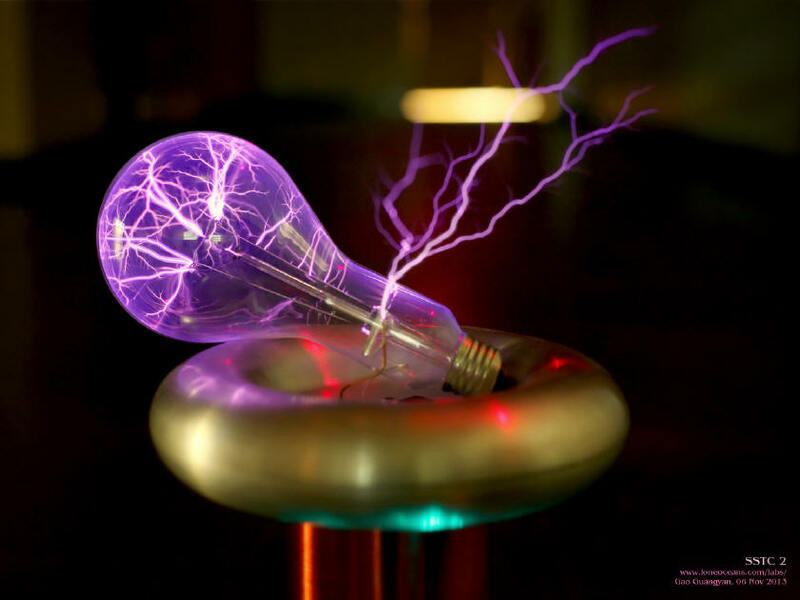 The way we achieve this is by switching power into the primary coil at the resonant frequency of the secondary. 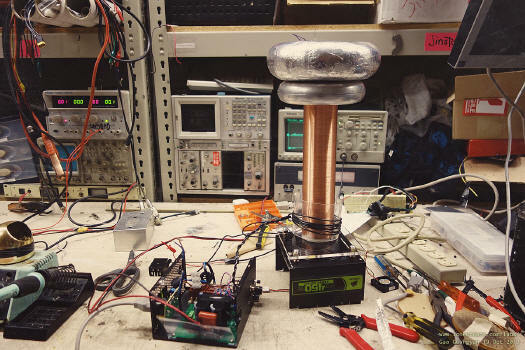 We do this by creating a high-voltage square wave across the primary coil using an inverter circuit. This circuit comes in two common forms - a half bridge or a full bridge. Line voltage (120 or 240VAC depending where you live) is rectified and stored in a large bus capacitor (several hundred to thousands of uF), and the inverter works to create an AC square wave across the primary. The result of this is a sinusoidal current in the primary coil due to it being driving at resonance. Next, we need to know what the resonant frequency is. To determine the correct frequency to drive the coil, an external oscillator can be used (requires tuning), or feedback can be taken from the secondary or primary coil for self-oscillation. *note* A DRSSTC differs from this with the addition of a primary tank capacitor in series with the primary coil. The goal here instead is to not only drive the secondary at resonance, but to also drive the primary at the same resonant frequency. Now, as the inverter switches the primary, the current is still sinusoidal, but grows. Additionally, due to resonance, the primary voltage also increases from line voltage up to the several kV. This gives the primary a better impedance match to secondary circuit. The current also increases up to several hundred (to thousands) Amperes. Due to this second resonance, this variant of SSTCs are known as Double Resonant SSTCs. The result is much larger sparks in the output! 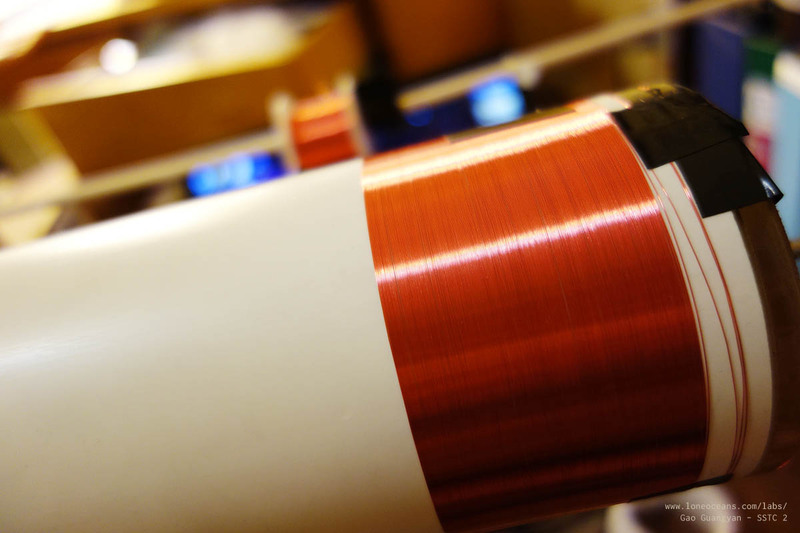 When the secondary coil is driven at resonance, a large voltage develops across the coil. Using an example of a swing, if we keep supplying 'pushes' at the correct resonant frequency, the swing gets higher and higher. Similarly, a large voltage develops on the top load, eventually leading to electrical ionization and breakdown of the air, forming sparks. With a basic understanding of how an SSTC works, lets see how we can get all the parts working together. Let us break down the SSTC into is fundamental building blocks. The are three main parts to the system. The first is the low-voltage logic control and gate driver. 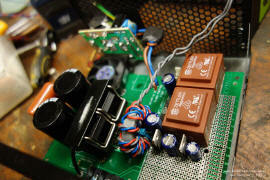 This part creates the signals to drive our inverter (half or full bridge). In this circuit, we find a way to generate the correct frequency either via feedback or by an external oscillator, and then create appropriate signals to drive our transistors in the inverter. The second is the high mains-voltage inverter itself, which drives the primary coil. 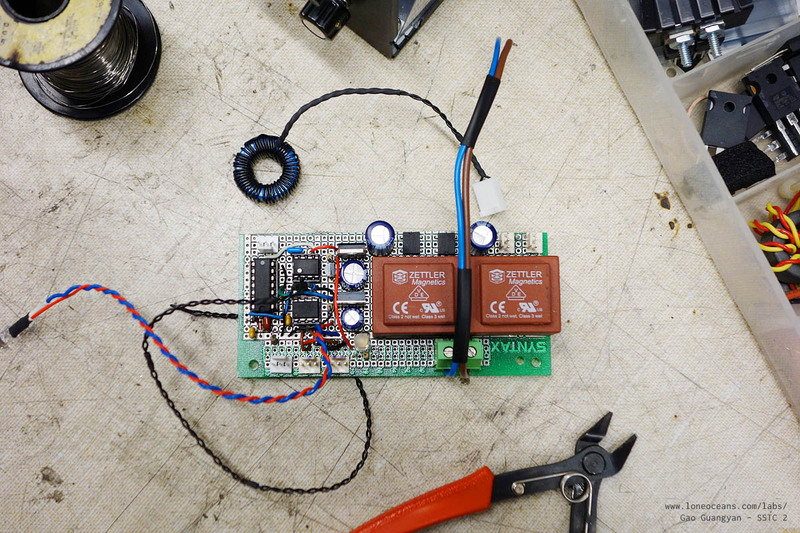 This circuit handles the big currents, and also consists of our rectification system (from mains to a big capacitor), as well as a set of large power transistors. MOSFETs have been used in SSTCs, but IGBTs have become popular choices. The last circuit is the secondary coil which basically consists of only the coil and the topload, and is electrically isolated from the previous two circuits. 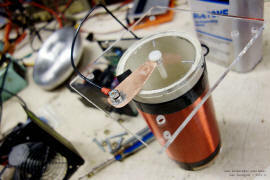 Driving the SSTC in continuous mode consumes large amounts of power and heats up the transistors significantly. Hence, SSTCs these days often come with an interrupter, which is basically a small controller which turns the gate driver on and off. This allows the user to control the duty cycle of the SSTC. The interrupter controls the pulse-width, which is the duration the inverter is turned on (usually from 10 to 300us in DRSSTCs, and up to several ms in SSTCs), and the breaks-per-second. We will examine these parts in detail in the next section. 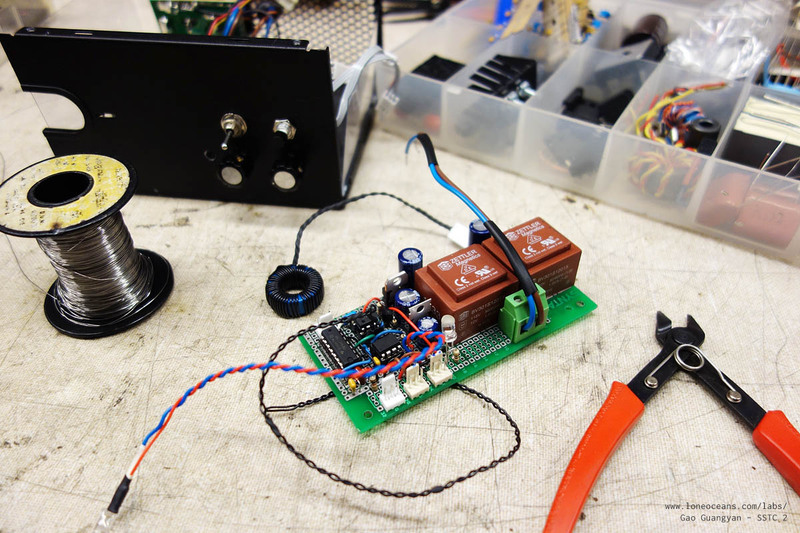 With the interrupter, we can now create a variety of modes to drive the SSTC! 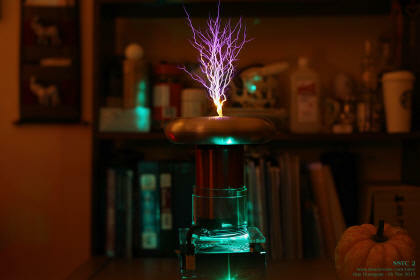 For example, I could set my interrupter to turn the tesla coil on at 200 Hz with about 10% duty cycle. 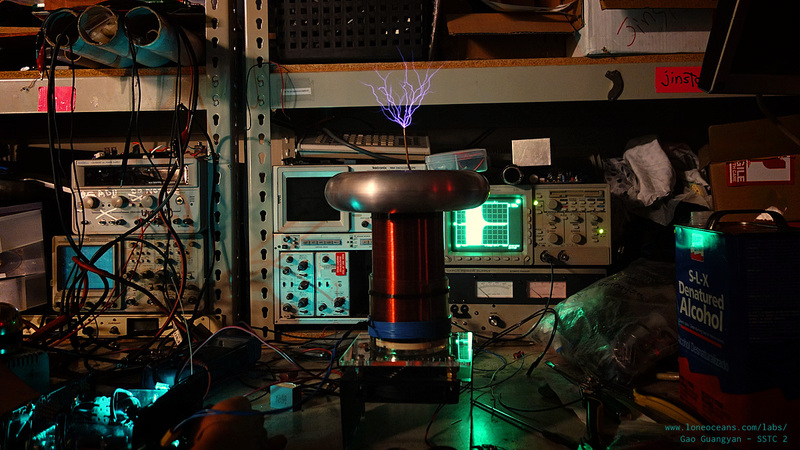 This means we turn the tesla coil on for 500us, 200 times a second. Each pulse makes a spark and an associated 'bzzt' sound. If we make this sound 200 times a second, we end up with a note at 200Hz (albeit a rather harsh one). We can vary this frequency and produce different notes (you can think of this like FM)! 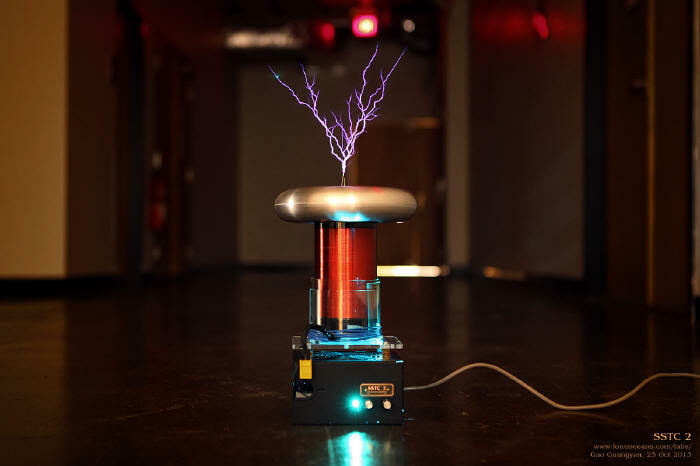 This is the basis for most musical Tesla Coils today. The second method is more involved and will not be discussed further here. But the basic principle is to run the SSTC in continuous-wave mode (no interrupter, so it is on all the time), but modulate the input voltage to the inverter with the envelope of the music (think of this as AM)! This allows a greater fidelity in output power. Consequently the spark that is created grows and contracts based on the input power, creating air pressure waves which are heard as music. The goal of the inverter is to produce a square AC wave across the primary coil. The bus supply as it is named, supplies the power to the input of the inverter. This is usually rectified mains AC, which can simply be stored in a large electrolytic capacitor. 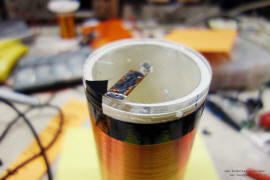 During switching, the inverter pulls power from this capacitor (several tens to hundreds of Amperes for the short duration of the on-time), which is driven into the primary coil. The capacitor is important to supply this large current draw. In addition, we do not wish for the voltage to drop too much during the on-pulse, hence we want a large capacitor. Typical values begin at around 1000uF. A few hundred uF works fine for small coils. As I am currently in the United States, I have to work with 120VAC line voltage. After rectification, this is just about 170VDC, which would give me +-85V in half-bridge configuration. However, running the primary at higher voltages produces bigger sparks! To increase the voltage supplied to my bus, I have used a simple voltage doubler circuit, which essentially produces 120V * 2 * (Sqrt 2) volts DC (about 340VDC). This is supplied to two 250V 1000uF capacitors (in series), providing a bus capacitance of 500uF at 500V (charged to 340VDC). Do not forget to add bleeder resistors across the capacitors to make the device safer! 100k resistors should do the trick. There are two possible layouts for the inverter - a half bridge or a full bridge. The main advantage of the half bridge is simplicity and lower part count. However, the advantage of a full bridge is twice as much voltage across the primary and hence most possible power. In this coil, a half bridge has been chosen for ease and compactness, but this can be easily extended to a full-bridge. Since I have a voltage doubler making my bus 340VDC, my primary coil sees +-170V across. One important thing to note in the physical design of the bridge is to minimize stray inductance. This is done by keeping any leads or wires physically as close together as possible. Because large currents will be flowing in our bridge, the switching can induce large voltage spikes if our inductance is too large. To solve this problem, I have used a PCB with a laminated bus structure for my half-bridge. 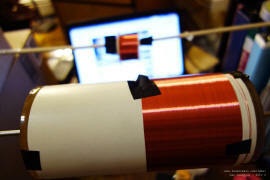 Check out my SSTC 1 for how I did it using wires instead. Keep your bus capacitor as close to the transistors as possible, and make sure that the transistors are mounted on a heat-sink. Additional things to take note of include adding subber capacitors to the IGBTs (film capacitors mounted physically close to the IGBT - these are meant to soak up transient high voltage spikes and thus are usually rated around 1kV and 1 to 6uF - I have omitted them in my design because of the low-inductance layout of my bridge. Also, adding Transient Voltage Suppressors across the CE of the IGBT (or DS of the MOSFET) - usually bidrectional TVS of the 1.5KE220 type are used (series if required), and minimizing bus inductance as much as possible to reduce voltage spikes. Running the transistors no more than 2/3 of their specific voltage rating is good practice also. SSTCs have traditionally been powered by MOSFETs (metal oxide semiconductor field-effect transistor) instead of the more common bipolar transistor. In a normal bipolar transistor, a small base current is used to drive a large emitter-collector current. In this way, BJTs are current-operated devices. However, in a SSTC operation where we may be switching significant currents (several tens to a hundred Amps) at high frequencies, we will need large currents (on the order of several 0.1 to 1A) to switch our transistor, making this very challenging. A MOSFET is a voltage-operated device, where a small gate voltage switches a large drain-source current. They are very nice as switches due to their high off-resistance, low on-resistance and only require a small gate current to turn-on (basically charging up a small capacitor in the gate to turn it on). Their fast switching speed is ideal for SSTCs. However, MOSFETs are more sensitive to static, and more expensive. In recent years, the demand for power electronics (e.g. inverter applications like electric vehicles) has seen the rise of a newer type of transistor, the Insulated Gate Bipolar Transistor (IGBT), which combines the simple gate-drive characteristics of MOSFETs with the high-current and low-saturation voltage of a BJT. Additionally, the MOSFET voltage drop is like a resistor, hence power dissipated goes up with I^2R - significant in high current switching. However, the IGBT has a constant voltage drop like a diode (actually increasing with the log of the current), the the power dissipated is more like IV, significantly less. 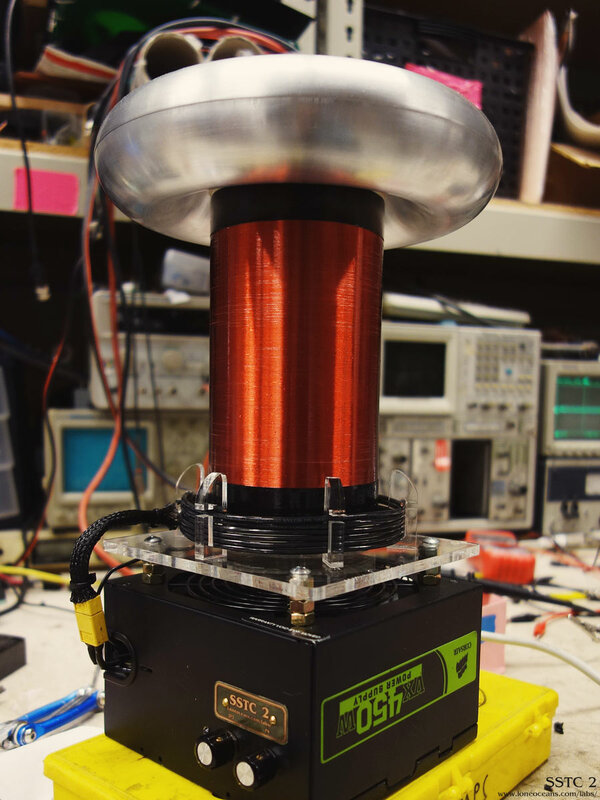 Hence, while MOSFETs are good for high frequency low current switching, IGBTs are better for lower frequency and high current switching, making them popular choices in the Tesla Coil community. This design should work with standard MOSFETs such as the IRFP260 (200V 46A), IRFP460 (500V 20A), or FCA47N60 (600V 47A). The use of these requires fast free-wheeling diodes in parallel to conduct current in the opposite direction. These free-wheeling diodes are used to reduce flyback, which is the sudden voltage spike seen across an inductive load when its supply voltage is suddenly reduced or removed. Due to the cheap costs of fast IGBTs with included free-wheeling diodes, choices such as HGTG20N60A4D (600V 40A) or FGA60N65SMD (650V 60A) or the well known Warp2 series from International Rectifier (such as the IRGP50B60PD1) are excellent choices. 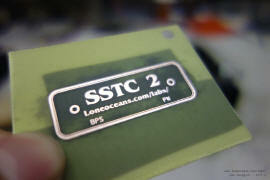 However, I had some HGTG30N60A4D IGBTs on hand and have decided to use them in this SSTC. Taking a look at the datasheet for the 30N60s, we see that they are actually rated for 18A operation at 200kHz (390V). If we look at the Current Rise Time / Delay Time / Fall Time etc, these all add up to 225ns. The general rule of thumb is to keep the switching time no more than 10% of each cycle. Since the transistors need to switch once every half cycle, we end up with a maximum frequency of about 222kHz. For reliable operation, we shall try to stay around or below this frequency at the specified 18A. Note that many Tesla Coilers end up running the transistors at higher frequencies and get away with it. For example, the famed IRGP50B60s have a rule-of-thumb operation frequency of <276kHz, but they are known to operate up to 300A at 400kHz. This however decreases reliability. Finally, note that the 30N60s have a pulsed current rating of 240A which is great - we will be approaching or even exceeding these pulsed ratings in DRSSTC mode! These days however, manufactures tend to skip over the actual pulsed rating and simply rate the transistor's pulsed rating by twice of the operating current. Because SSTCs tend to run the transistors for long durations or even continuously (versus several 10s of us in DRSSTCs), we shall try to keep within continuous specs for reliability. With our inverter built, we need to find a way to switch them on and off correctly. This is where our driver comes in. It's goal is to switch the inverter at the correct frequency so we achieve resonance. It also has to be powerful enough to charge the gates of our IGBTs quickly. Driving the gates of these transistors requires a powerful gate driver which can supply a hefty current. 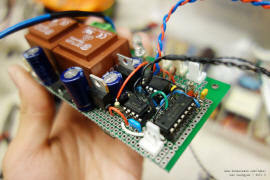 Think of the gate like a small capacitor which needs to be charged up before it switches. We would like the gate to be turned on as quickly as possible. Fortunately, there are special MOSFET gate-drive chips which do this all for us. The most commonly used are the Texas Instruments UCC27321 and UCC27322 fet drivers, popularized by Steve Ward's designs and now used everywhere. They are single channel inverting and non-inverting drivers, with a 9A drive capability with an enable pin. The enable pin is important for us if we want an easy way to control the driver via our interrupter. Hence, Tesla Coilers usually use the UCC2732x together to create a +- Vcc (usually 12V or more) signal to drive the gates. To simplify things even further, I have instead found and used the UCC27425 which combines an inverting and non-inverting driver all in one 8-pin chip! It also comes with its own enable. The drawback is its lower power capability (4A), but that's fine for a small coil. Driving the transistors is a simple exercise for a power engineer, but more challenging for a hobbyist. We cannot simply connect the driver output to the IGBTs. They have to be electrically isolated from each other. Two main options exist - a dedicated driver for each IGBT connected via opto-couplers, or a small gate drive transformer. The advantages of opto-isolators include precise control and minimal signal interference, but require additional components and complexity. The GDT on the other hand, is much simpler to implement, produces good results and is significantly cheaper. The GDT is an obvious choice. Note that there are only *some* cases where a GDT can be used (i.e. cannot turn on or off for extended times unlike opto controls). Care must be taken when making your own GDT. It needs to be accurately wound on a suitable ferrite core, and isolated properly. 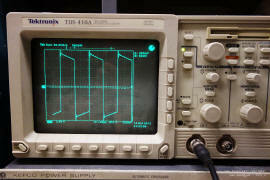 The best way to test if a core is suitable is to wind a few test windings on the core, connect one end to a signal generator (square wave) at the planned frequency of the coil, and scope the outputs with an oscilloscope to make sure the signals come out looking more-or-less square. In the above photos, the left photo shows the scope when directly connected to my signal generator. The right photo shows the output of my completed GDT. Note that you cannot simply use any toroid you find as a GDT! It needs to be a suitable ferrite material (no iron cores), and the only reliable way to make sure it will work is to do the test I did above, so you do need a scope and signal generator at the very least. I am driving the primary of my GDT with +-12V. However, in order to turn on the gates of my IGBTs as quickly as possible, I want to drive them at a higher voltage of 18V. Hence, my primary of the GDT is wound with 8 turns and the secondaries wound with 12 turns to provide a 1.5V step up. 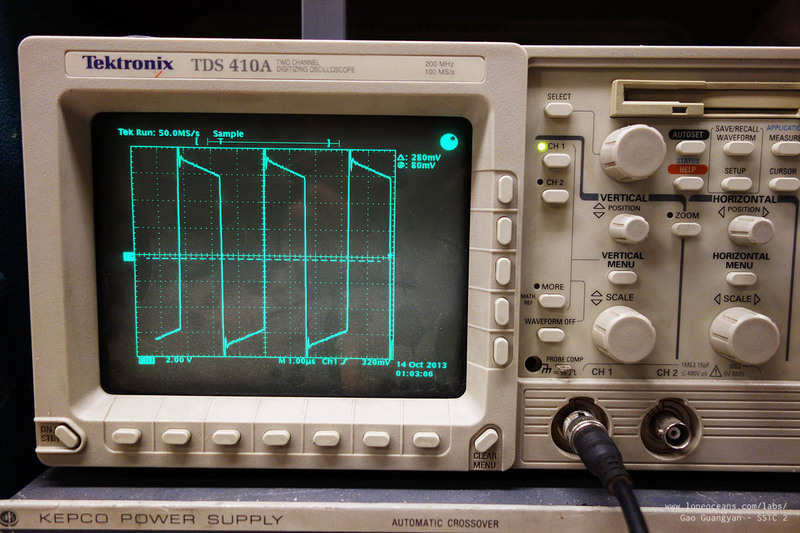 Scoping with the oscilloscope shows that it works (see photos above, noting the units)! Above is a photo of my completed GDT. To protect the gates, it is useful to add something like 22 or 33V zener diodes / TVS across the gate and source to protect the gate in the event of any voltage spikes. I have omitted them in my design for this coil. The frequency generator drives the frequency of the primary coil and it should be able to be adjusted to run at the resonant frequency of the secondary coil. The most obvious way is to use an external frequency generator, such as a TL494, which was done on the first generation SSTCs around the start of 2000. However, this is quite ineffective in practice. When a spark is produced at the top of the secondary coil, it has its own capacitance and this decreases the overall resonant frequency of the circuit. This puts the coil out-of-tune. A common method of use simply calls for a vertical wire being places a few centimeters from the coil, around 15cm in length. This acts as an antenna, picking up a small sinusoidal current. Using schottky diodes (diodes with a low forward voltage drop, and hence, fast) to clamp the signal to ground and +Vcc, so we do not fry our drive chip (Germanium diodes like the 1N60 are fine also), we obtain a square signal to the input of our driver. Hence, the coil is self-tuning. This method represents the easiest and most convenient way and is what my SSTC 1 uses. The disadvantage of this is the somewhat finicky positioning of the antenna. Another method is obtaining feedback using a small current-transformer on the secondary coil. 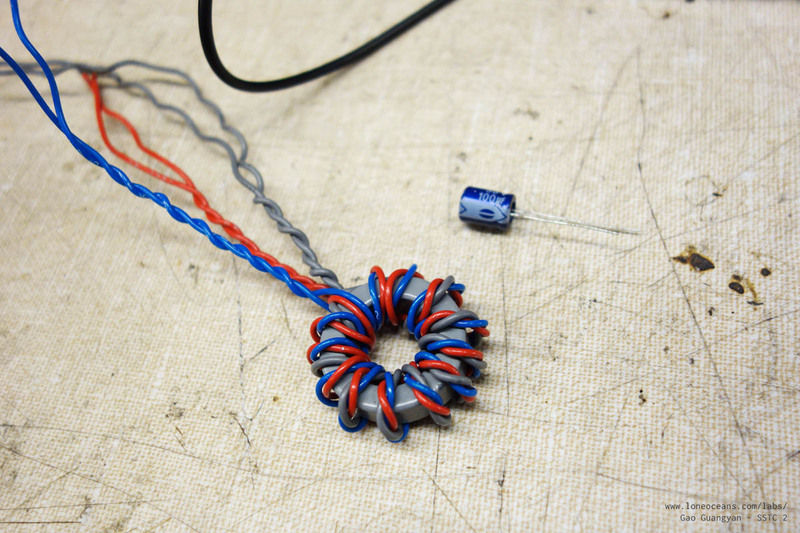 This is constructed by wrapping around 50 turns of wire on a small ferrite core with the secondary wire going through this ring on the ground side. Care must be taking to ensure the right phasing, which is simply done by reversing the direction of the secondary wire if the phasing is wrong. I find this to be more reliable than the antenna, and removes the need for a fragile wire sticking out of the driver. Thus I have employed the use of secondary current feedback. Likewise, schottky diodes clamp the output. The output of the current transformer is fed through two logic inverters (74HC14 or similar) which cleans up the signal to the Mosfet driver. The interrupter can be any circuit which gives a 1-bit signal (on or off) to the driver. There are many ways this can be implemented (or as mentioned, not implemented at all). Perhaps the most popular way is using two 555-timers together, one running in astable and one running in mono-stable. By varying the resistors connected, one can vary the pulse-width and the frequency. 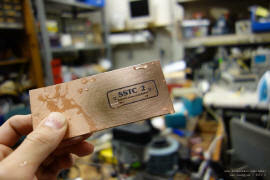 See my SSTC 1 which uses such an interrupter for more details. The output of the interrupter is usually some kind of logic signal (usually 0V for 0 and 5V for 1), and this can be fed directly into our drive chip's enable pin. 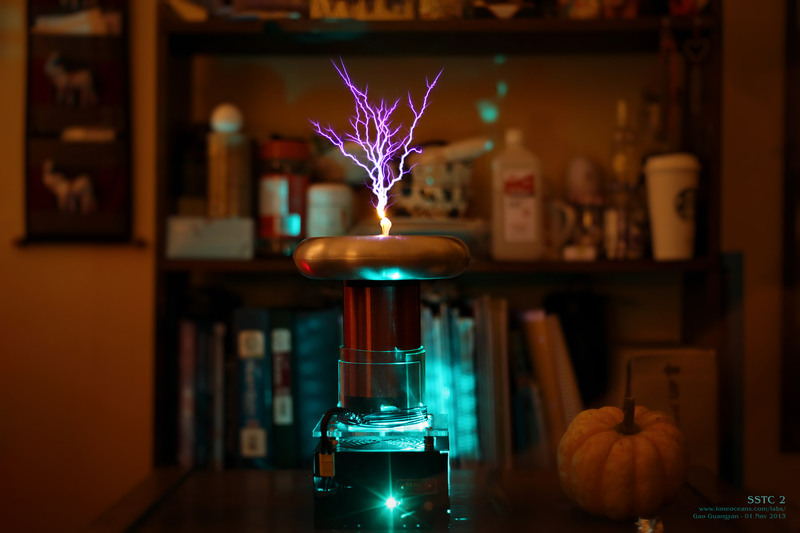 However, especially when running large powerful Tesla Coils (where the spark length can make the coil very dangerous to be near), it is often a good idea to control the SSTC from afar, necessity the use of an external interrupter powered by a battery with a wire leading to the coil (a shielded RCA cable is usually used). For an even safer operation (and greatly reducing interference from the RF produced by the Tesla Coil), fiber optic can be used to transmit the signal. This way, the interrupter can be completely electrically isolated from the Tesla Coil. This was implemented in my DRSSTC 1 using a standard plastic fiber optic cable, and my DRSSTC 2 using a 62.5um multi-mode ST fiber-optic interface. 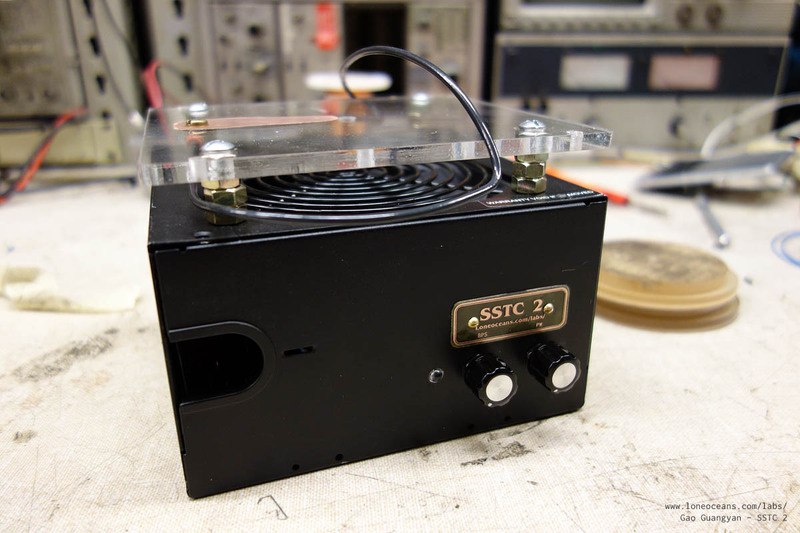 For simplicity, elegance and compactness, I have decided to integrate the interrupter directly inside the SSTC this time since it will be in a shielded box. I have also used an ATTiny85 micro-processor to produce the interrupter signals instead of a standard 555 timer. This saves me a bunch of space on my PCB since instead of having two 555 chips and a bunch of capacitors and resistors, I only need one 8-pin microcontroller! Two potentiometers make a variable 0 to 5V output, which feeds into the ATTiny's ADCs. This voltage is read and allows me the control the Pulse-Width and the Frequency, from about 1Hz to 254Hz, with a pulse width of around 10% capped at 1.5ms (user adjustable). Two of the ATtiny's pins are used to measure voltage from two potentiometers. These have a 10-bit precision (out of 5). Using the values, I scale the pulse-width and the frequency. 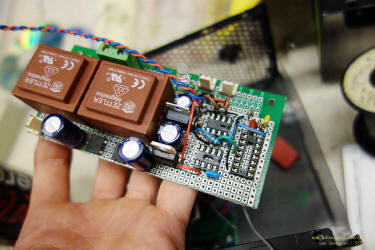 One output goes directly to the UCC mosfet driver via a 5k resistor, and another output simply lights an indicator LED. 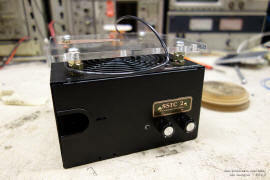 In SSTCs, there are a few things to focus on when designing the secondary coil - we want to have good coupling but not too much so that arc-over (from primary to secondary or racing sparks on secondary) occurs, and we want to increase our primary inductance to reduce magnetizing current (but not too much since more current = more sparks). The equation below gives L for a solenoid. As a result, most SSTCs have 'short' secondaries, i.e. have a small aspect ratio of about 1:1.5 to 1:3 (versus 1:4 to 1:6 for normal SGTCs) and cylindrical primaries (good for high coupling). 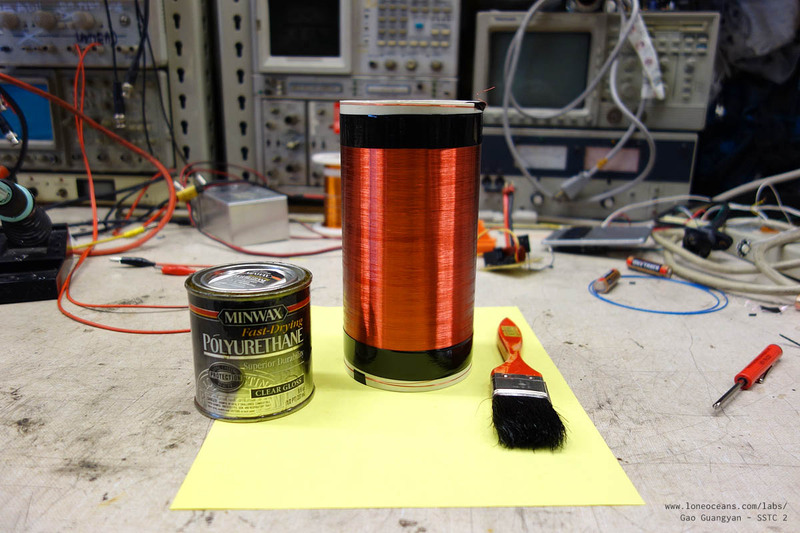 Additionally, they are usually quite fat in diameter (this increases primary inductance because the primary is usually wound as a tight coil around the secondary coil). From the equation of Inductance of an air-core coil as above, we see that increasing the turns increases L to the square, and increasing the diameter of the coil also increases the inductance by the square (since area increases by the square of linear dimension). 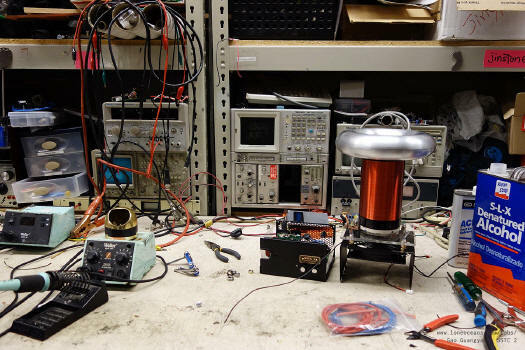 Additionally, we want to drive our primary coil at a suitable frequency - too high and we run into problems with our inverter transistors since they do not like being switched too fast. Too low and the size our our coil becomes physically too large. This is a run-through of how I designed my secondary coil. First, I chose my frequency to be in the ballpark of 250kHz. If you recall the brief analysis in transistor selection above, we found that we should keep below 222kHz as a rule of thumb. However, making the resonant frequency too low requires a physically larger coil, so a balance needs to be made... Next I knew I had some extra PVC pipe in the 3.5" dia size. I also had a bunch of 34AWG wire on hand, which occupies about 159 turns per inch. With a winding of 7 inches (or a 1:2 ratio), I get roughly 1100 turns. This gives me a resonant frequency of 371.27kHz. 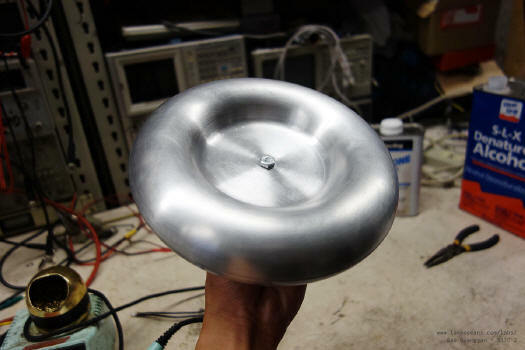 Adding a 8" by 2" toroid on top, I drop the resonant frequency down to around 251kHz. A winding of 6 inches gives 272kHz. Hence, I can simply wind the coil for about 6 to 7 inches with AWG34 on a 3.5" secondary and add a small topload. With the calculations done, I proceeded to wind the coil. 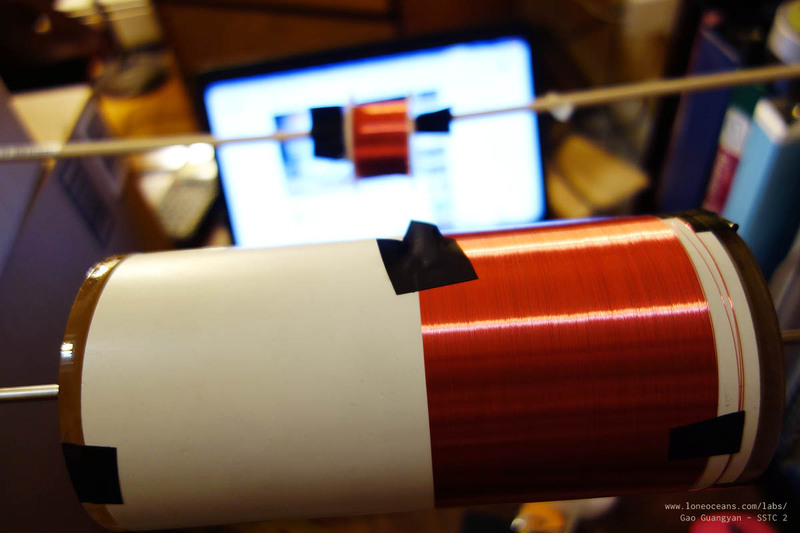 I wound enameled copper magnet wire (34 AWG) on a 7 x 3.5" PVC tube for a length of 6.25". This was done by hand as shown above, and took just about an hour and a half with short breaks in between. The reason why coilers use magnet wire is because of its thin insulation which allows us to get as many turns per unit length. With a 98% fill-rate, this should give me about 970 turns. Together with an 8 x 2" aluminium toroid, JavaTC gives me a calculated secondary resonant frequency of 256.99kHz with a secondary Q of 168. Here is a screenshot of my JavaTC simulations. The results are from a 3.5" x 6.25" secondary winding of AWG 34, giving me about 972 turns for about 98+% fill, with a 10 turn secondary 3.7" x 1.25" x 10 turns of AWG 14, and a 8" x 2" toroid. Notice adding the primary coil does change the resonant frequency and other parameters. It also shows (to-scale) what the final product will look like! 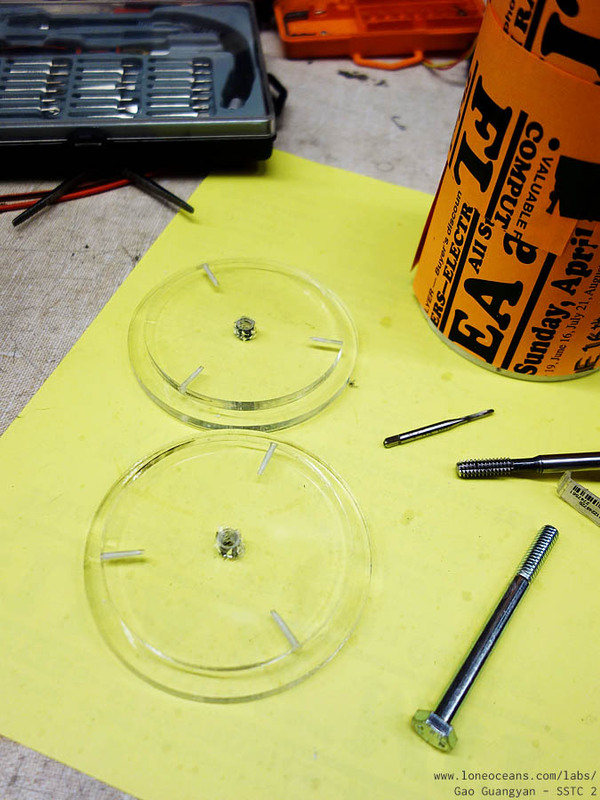 Finally, acrylic discs were cut and glued together to form endcaps, which were then affixed to the secondary coil with two small 2-56 screws per cap. Finally, the coil was given several coats of oil-based polyurethane varnish. I used Minmax Clear Gloss polyurethane, but any type of varnish should work fine. Remember that several thin coats are always better than one thick one (and it dries a lot faster!). Three holes per side of the secondary coil were drilled and tapped to accept 2-56 screws, which then hold the end-caps in place. Finally, each end of the wire was terminated by soldering it onto a short copper strip taped onto the end caps. The last photo in the top right shows how I affix it to the base plate, with a grounding strip connecting the ground wire to the secondary coil. The total resistance of the entire connections from topload to mains ground is just slightly over 200 Ohms. For the primary coil, this is made by simply winding a few turns of thick wire (>=14AWG) at the base of the secondary. For a normal SSTC, we generally want good coupling and many turns to reduce magnetizing current. Around 6 to 9 turns should do the trick, but turns up to 20 are also common. Experiment around and see which produces the best result with a suitable steady-state current and minimal heating of the inverter. One important note is that it is important to add a DC-blocking capacitor in series with the primary coil across the inverter output. In half-bridge configuration, two capacitors can be used in series across the + and - of the bus rails, with one end of the primary connected to the bridge output and the other to the middle of the half-bridge. This capacitor should be a small fraction of the bridge impedence (Vout / Iout), and should be set to be well above the resonant frequency. Typical values range from 1 to 6.8uF, and are typically film capacitors. Note that the reactance X_c of the capacitor is inversely proportional to the capacitance, so the fairly large DC-blocking cap (vs say a resonant capacitor for DRSSTCs which are on the order of tens of nF) has relatively low reactance. The DC blocking cap comes from switch-mode power supply designs, where saturating a transformer can destroy the transistors due to high currents. Likewise, without the capacitor, if one transistor latches on for too long, this causes a short between the bus capacitors through the transistor, which can lead to the potential death of your bridge. Especially for half bridges, any DC imbalance can also add a DC bias current without the capacitor. That said, many people have built coils without the DC-blocking cap, and it is not necessary especially for small coils. However, they can save the day in some unexpected circumstances and are relatively cheap, so it is prudent to add one. I've used a 4.7uF MKP metalized polypropylene film capacitor in series with my primary (you should use a good quality polypropylene capacitor - I used 4.7uF because I had one on hand, but any capacitor around this value should be fine). 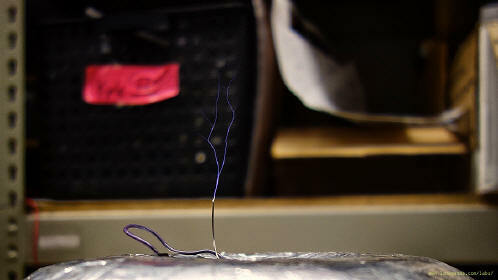 If you browse around some of the earlier photos of the coil, observe that it used some thin blue wire (7 turns). I found out that while this produced good sparks up to 8.3", the coupling seemed to be a bit too high causing the occasional secondary-racing-sparks problem especially if a sharp breakout point was not used. So I decided to build a slightly better primary coil. I designed and laser-cut some acrylic holders for the primary coil so it formed a structure about 4.56" diameter around secondary coil. This was placed slightly under the beginning of the secondary coil and uses 14 AWG wire for 6 turns giving a winding height of 0.65". JavaTC returns a coupling of around k=0.25 or so (full results shown above), with the primary inductance of 7.412uH. The secondary has a resonant frequency of 252kHz. The photo below shows the new primary supports! For reference, the old primary had a coupling closer to 0.28 and inductance of ~8.5uH. From these values, the reactance of the primary can be calculated to be X_L = 2pi * f * L = 11.74 ohms. Since the DC blocking cap presents a low reactance (we'll ignore it) and assuming the primary resistance to be negligible, with a 169V (120 * sqrt 2) peak to peak square wave across the primary, we should see a peak current of about 14.4 Amps! This increased current compared to the old primary should give larger sparks. So how well does theory match up with the real world? 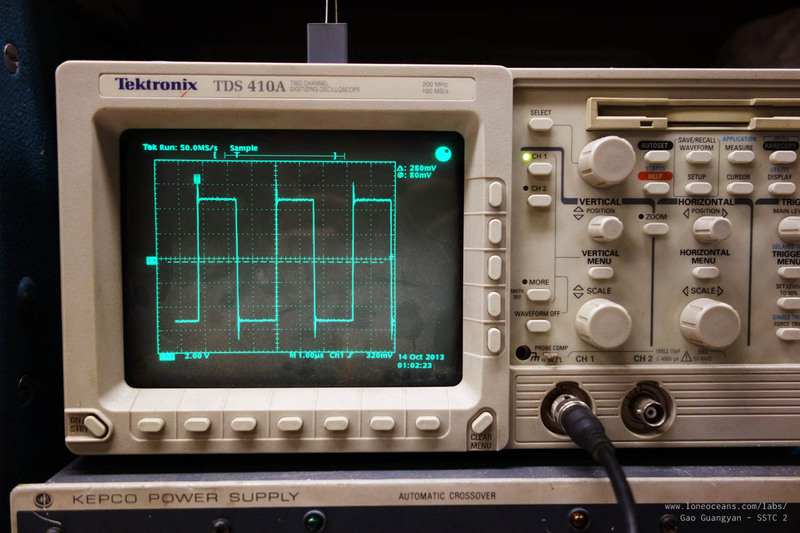 I hooked up a 300 turn current transformer (terminated with a 47R resistor) and measured the current of the primary with an oscilloscope (photo above). 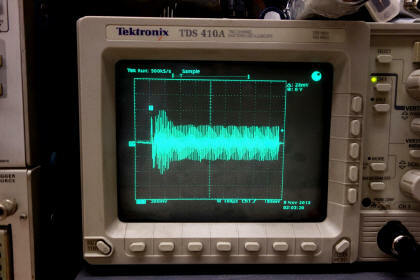 From the waveform, the steady state current shows a 2.23V max (this was a 10x probe). This means a current of 0.0474A through the resistor, or 14.23A through the primary - it matches what we expected from our calculations. Note that the peak current goes up to about 30A (27.9A as seen in this waveform) before streamer loading on the secondary, but the steady state current remains around 15A regardless of the length of the pulse width. If you recall our quick analysis in the transistor selection part above, you can see that this is actually within or at least close to ratings of our IGBT (18A continuous at 200kHz) and should be able to run happily for long periods of time :). It's always good to have a coil run within specs - something difficult to do in DRSSTCs! For those of you designing your own primary coils, it is good to decide on a current you wish to run at (anything below 30A should be good for reliable operation or even 50A for well heat-sinked transistors), and add/remove turns while making sure your coupling doesn't get too high and cause racing sparks on the secondary. I used to make my own toroids out of ducting and aluminium foil, but have also had good results with hand-made foam toroids wrapped with foil as well as aluminium ducting toroids. However, I decided to buy a cheap stamped toroid. It measures just about 1.9" x 8". I also spent some time on the lathe sanding it to remove some marks left over from the stamping process. This gave my toroid a nice spun-aluminium finish. According to my calculations, the effective topload capacitance is just about 8.3pF putting my total resonant frequency around 250kHz (it's closer to 308kHz without the toroid). Finally, a sharp breakout point was added. 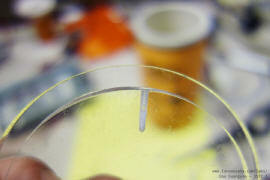 This was simply a wire cut at an angle to produce a pointy tip. 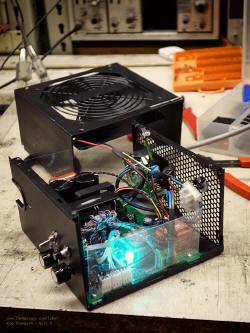 Part of the inspiration for the project came about when a friend of mine threw out a spoilt computer power supply unit. It came in a nice black box with an IEC power input jack, ground connections and a nice big fan all integrated. I decided to work within the constraints of this box for my SSTC. The goal is to create a very simple, modular coil which I can transport around easily and quickly. The box did place a constraint on how large my components could be. One thing I had to compromise was the size of the heat-sink for the IGBTs. To make up for this, I added two headers for which I would be able to connect two fans. This large flow rate combined with my low duty-cycle should be sufficient. Finally, I wanted to make some sort of label for my Tesla Coil! 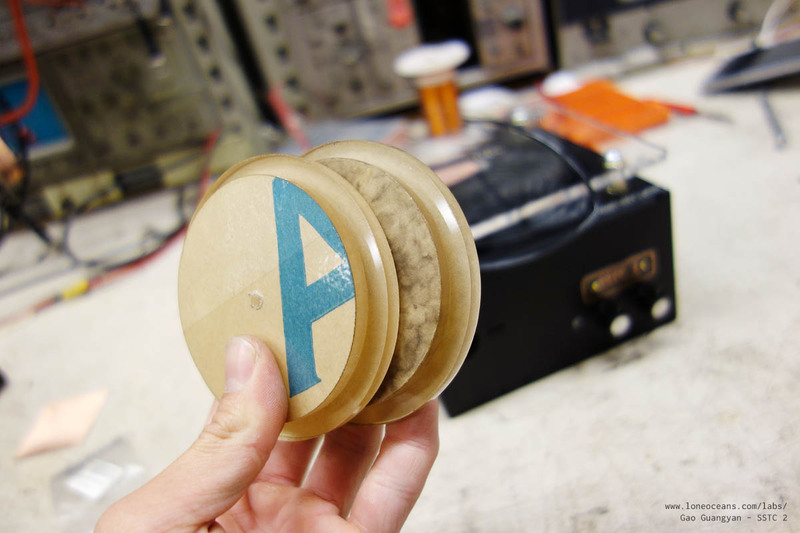 This was simply done by etching on a spare piece of PCB a little label + the BPS and PW labels for the two potentiometers. This turned out beautifully and the label is attached to the box via two 2-56 brass screws. A thin coat of varnish was applied over the label to prevent future oxidation of the copper. Finally, note the laser-cut platform for the coil-forms, as well as the convenient hole in the box for the grounding and primary wires to go in to. The platform also allows intake for the big 120mm fan which provides cooling for the whole coil. My original plan was to etch my own PCB in making the inverter. However, since this would be done in-house, it would be challenging to make a double-side PCB, which is essential in creating a low-inductance bridge. 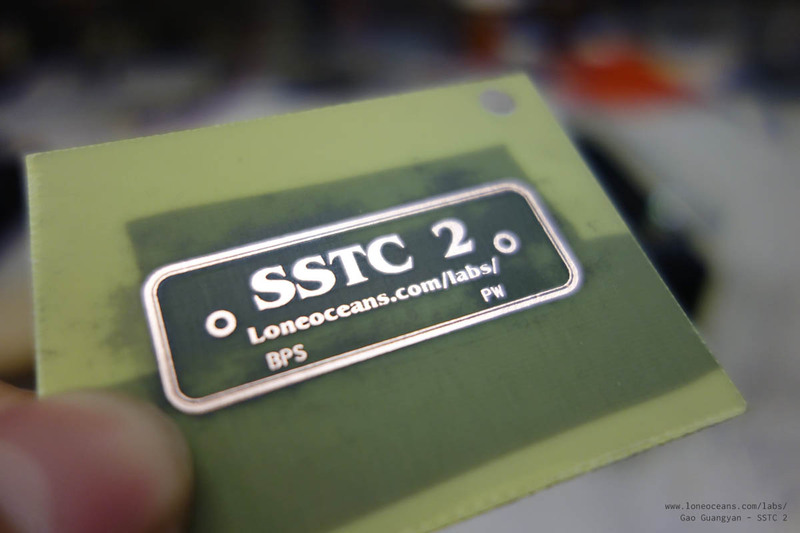 Fortunately, I came across some old PCBs created by my friend Bayley. 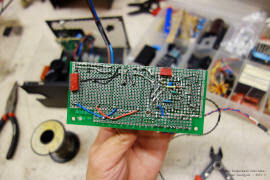 A few months ago, Bayley was working on a small single-board DRSSTC, and had some spare old-revision boards left over. Conveniently, the inverter section was physically separate from the driver section. So I cut the PCB in half and used the inverter side to mount my bus capacitors and IGBTs. This low-inductance layout should hopefully remove the need to add bulky film snubber capacitors and TVSs. 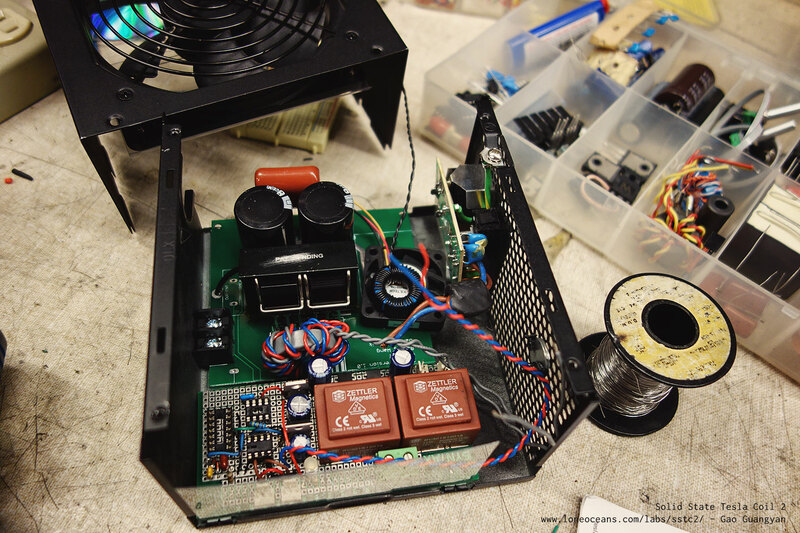 Here you can see how the layout looks like inside the power-supply box. One side with the head-sink and the two electrolytic capacitors is the half-bridge with the GDT installed in place. The right side is the control circuit board, dominated by two small 12V transformers. Everything is a tight fit, but works out well. The heat-sink for the two TO-247 transistors is a bit on the small side, but the large fan at the top of the box + and additional small fan inside, coupled with my low duty cycle should help keep things cool. Remember that the goal of this project was to keep things simple and compact, but you should probably add a bigger heat sink for your coil. The driver circuit was simply assembled on a perf-board and connected via wires and solder bridges. I decided not to etch my own PCB this time, because wiring up this way should be easy enough for a small circuit. After all, it only uses three chips - the ATtiny interrupter, the UCC and the Hex Inverter (which could probably be emitted)! The logic power comes from a small 120V to 12V transformer which is full-wave rectified and regulated via a 7812 and 7805. A generous amount of filter capacitance was added on the logic bus. A separate transformer provides 12V for the two computer fans used to cool the electronics. Above is a photo of the more-or-less completed driver (without the chips yet). The bulk of the board is taken up by two small 120V to 12VAC EI30 transformers, good for supposedly 1.5VA each. The left transformer has two 3-pin molex headers for easy connections to the fans. Note that the output is rectified by two bridge rectifiers and have their own filtering capacitors. These two circuits are separate. The other filtered 12VDC rail is regulated by a 7812 and chained with a 7805 for my 5V rail running the ATtiny and 74HC14 inverter IC. The output of the ATtiny85 is sent to the input of the UCC mosfet driver (via the blue resistor). The two other 3-pin headers at the top of the board go to the potentiometers. Another header was subsequently added for secondary input to the 74HC14 for feedback. Finally, a low-voltage lock-out was also added subsequently (yes they all fit nicely on the board). After a bit more work, all the components are populated. Note the two LEDs - one is directly soldered on the board and serves as a power indicator LED. The second is connected to the second output of the ATTiny85, and provides a visual indication of the output of the interrupter signal. Finally, the 50-turn secondary current transformer is also visible. The bottom of circuit board looks a bit messy, but it works well. The circuit was tested carefully and found to work well first time around :-) with no problems! The board was inserted into the case (held in place via two screws), and plugged in. A few more things to note here - I used some relatively thick plastic sheet as a safely insulation liner between the bottom of the PCB and the metal case. Also, you might note the single pole and push-button switches installed at the front of the box. This was meant to control the interrupter signal, but I subsequently removed them for simplicity. Turning the Freq potentiometer to 0 automatically turns the interrupter off. This is all controlled via ATTiny85 programming. Finally, yay for the Aqua LED (it really looks a bit more green in real life)! With all the parts completed, it's time to put them together. Above shows SSTC 2 with the secondary and topload all securely in place (along with the messy workbench!). It's now time to test the coil! And as a reward of reading till here, here's the schematic for the entire SSTC 2 for your reference! I've tried to make it as straightforward and understandable as possible, but you should make sure you understand every component of the circuit before building it. 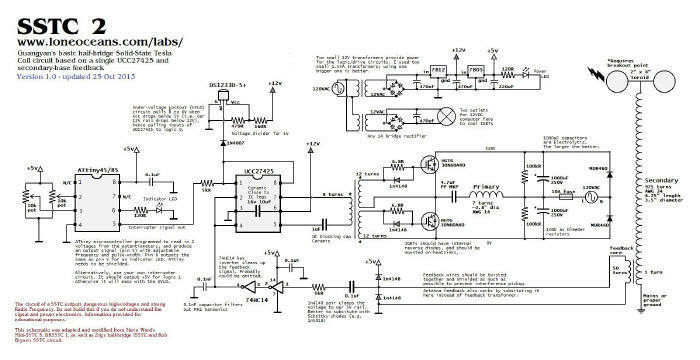 This schematic was modified from the original designs of Steve Ward's SSTC 5 schematic, whose contribution to the Tesla Coil community has been immense. 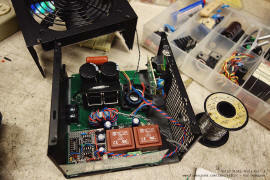 The original designed used an antenna feedback and dual UCC Mosfet drivers for the GDT, and a 555 interrupter. I replaced the interrupter with a programmable ATtiny microcontroller instead. Finally, with more inspiration from Bayley's and Zrg's SSTC, I replaced the dual UCCs with a single UCC driver capable of dual invertering and non-inverting enables to simplify the circuit even more. An additional under-voltage lock-out is employed for safety but could be omitted. I believe this circuit is almost as simple as it can get whilst still being generally quite reliable. I've also added as many notes to the circuit. The voltage regulation circuit can be simplified with a single transformer. For feedback, you can use any sort of feedback (antenna, secondary, etc), and the 0.1nF filter cap can also be omitted since it does introduce some delay in the feedback loop. If I were to put it in again, I'd put it before the 7414 inverters directly on the output of the CT instead. Now the final piece of the puzzle is the interrupter code. I've presented it here for you to use. Feel free to edit it to suit your needs! The file is in an Arduino .ino format and was designed to be programmed into an ATtiny85/45 micro using the 8Mhz internal clock and using the Arduino as an ISP programmer. Download the latest version 0.63 here. For those of you who no not have an Arduino, you can download the Arduino IDE, compile the code and burn the .hex code the normal way. If you do not have any experience with microcontroller, you can simply build a standard 555 circuit (see my SSTC 1 page for details), or any other interrupter of your choice. If this project has been helpful in any way, I'd be happy to hear from you and the results of your coil! Enjoy and be safe! With all the components done, it was time to test the coil! 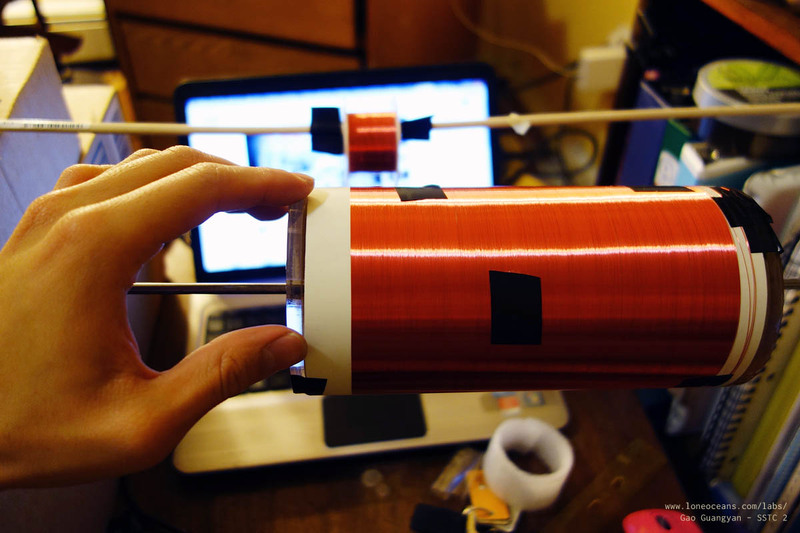 I was still not done with my actual secondary coil yet, so I used a temporary secondary coil lying around the workshop. It measures 12" x 2.5" with 34AWG. A 6-turn 3.5" primary was used with a 6x1.5" + 7 x 2.5" toroid, bringing the resonant frequency to about 300-350kHz. It is prudent not the test the coil at full power first, so I ran the coil off a DC power supply. Notice the two switches in front of the control box, which I used to connect/disconnect the ATtiny85 output from the UCC. It turned out to be a bad idea because the UCC input goes to high when it is not connected = CW mode, but can be easily solved by connecting to ground via the switch. Instead, I removed the switches and changed my programming of the ATtiny85 to turn-off when the BPS knob is turned to 0. This simplifies the control of the coil. The coil starts to oscillate at around 20VDC, and I tested it up all the way to 90VDC on the bus. 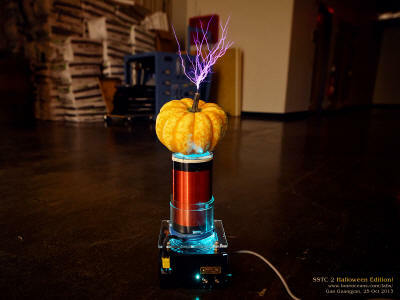 The coil made small sparks and generated a very strong RF field around the coil, which can be felt in terms of burning-tingling sensations when a metal object in the vicinity of the coil is touched. The coil is working! The first time a Tesla Coil makes sparks is generally regarded as the 'First - Light', and is considered a milestone event by Tesla Coilers! After first-light, usually a bit of tuning will need to be done, but the fact that the coil makes sparks is generally a good indicator that the main components are working correctly. This photo records this moment! Here, the coil is running at a relatively low BPS (around 50 - 100Hz), with a pulse-width of about 400+us. The input voltage is just about 80+VDC across the bridge, which is a lot less than the 340VDC it will see eventually. Here, it just about makes 2.5 - 3" sparks. Also, the coil is running with a separate secondary from the one I will be using (it's a 12" x 2.5", 34AWG coil with a 6-turn primary on a 3.5" form, with two small toroids, bringing the resonant frequency to around 300+kHz). During this test, my secondary coil was still not completed yet. After the varnish on my actual secondary coil had dried, it was time to test it! As before, I began by winding 10 turns of wire as the primary coil around the base of the secondary (note the PVC sheet in-between as insulation), and connected my bridge to a 0-100VDC power supply. The coil sprung into life easily, but it was clear that when I raised the voltage over 80V, I started to get skips (i.e. the interrupter would send a signal but the coil would not oscillate). This made me try various techniques including adding more feedback turns on my secondary feedback transformer, but it did not solve my problems. As a last ditch attempt to figure out what was going on, I remove the secondary feedback and use a bare wire antenna - this worked perfectly! However, notice in the setup above that my coil was running with the electronics outside. It turned out that the ground wire from the base of my secondary to the control box was picking up interference from the primary coil of my Tesla Coil, causing it to give unreliable feedback. This makes sense because above a certain threshold of voltage in my primary, the current will be large enough to produce significant interference in my ground wire. This problem was solved by putting the ground wire inside the grounded case. The coil then runs very happily off secondary base current and is what I use in my final design. I then switched to a variac for input to my bridge, and slowly cranked up the power. Above around 100VAC in, I started to get small flash-overs on my secondary coil - hinting at  Insufficient insulation,  too much coupling and  some slight asymmetry in the coil. To solve , I added a second layer of insulation using an acrylic form. For , I reduced the number of turns from 10 to 7, and for , I tried to make the coil more symmetric. Ideally I'd have a bit more spacing between the primary and secondary coils. With all this done, I assembled everything back together into the case and tested it at full power. The coil works and performs admirably! I'll let the photographs do most of the talking! Above shows the coil just after being assembled together. It makes just over 7.5" sparks to air, which is not bad considering the secondary winding is only 6.25 inches. Right now the coil's interrupter runs from 1 Hz to ~500Hz with 1000us on-time max and a 20% max duty cycle. The photo above shows the coil running at 1000us pulses (120VAC input). I'm glad that the coil came together quickly and as planned and I'm happy with the performance. 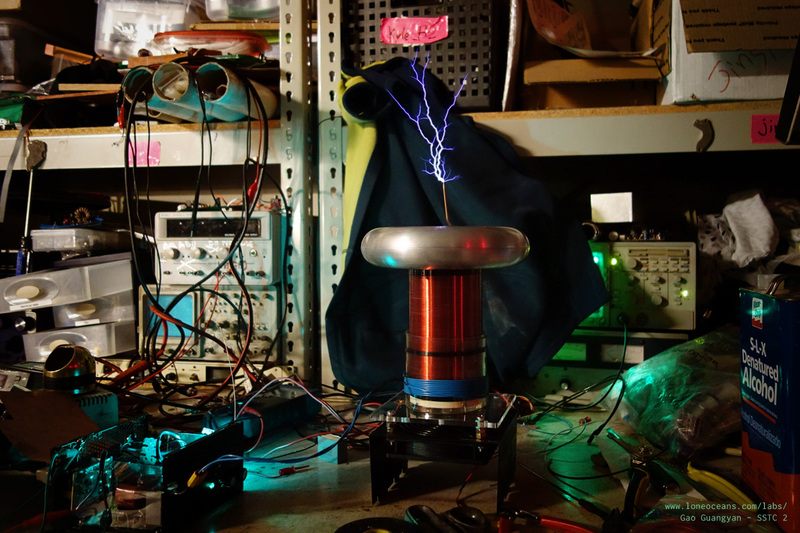 I should be able to push even bigger sparks but running this at higher voltage, but the goal of the project was the make a small, reliable demo-coil in a weekend. The project actually wound up taking 2 weekends, but I think it was worth the extra effort to make things look nice. 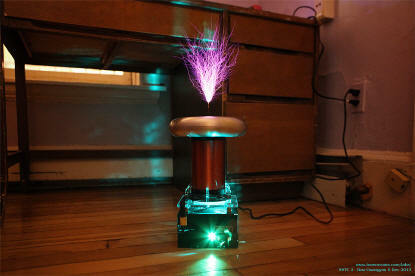 It also met all my design goals resulting in a compact, portable and reliable Tesla Coil suitable for demos. Here, SSTC 2 is making around 8" sparks with 1000us on-times. Right now there are no plans to made additional modifications to the coil except for maybe tweaking with the interrupter code and perhaps lowering the overall duty cycle to 10% max but increasing the max pulse width to 2ms. Till then, I hope this page has been helpful in your quest to design your own SSTC :). I made a few small tweaks to the interrupter code. The coil now runs from 1 to 254Hz and pulse-width from 0 to 1.5ms for thicker more fiery sparks. I also updated the interrupter code which is available for download above. I'm now happy enough to say that the coil is done! Some final observations include that it still does need a breakout point to breakout, otherwise the coupling seems to become a bit too great leading to occasional racing sparks on the secondary, but this happens quite rarely if I don't use a sharp breakout point. All is fine with a sharp point. I believe this is easily fixed by simply making the primary coil very slightly wider instead of directly onto the secondary coil. Removing one turn would also probably help. Best spark-length to air to date is now 8.3 inches! As mentioned above, I decided to add some real primary stands to reduce the coupling, and will also allow me to remove the need for the somewhat messy plastic wrapping around the secondary coil. By increasing the diameter of the primary, I was able to reduce the number of turns from 7 to 6 which allows slightly higher primary current due to its lower inductance, all while reducing the coupling for reliable operation. 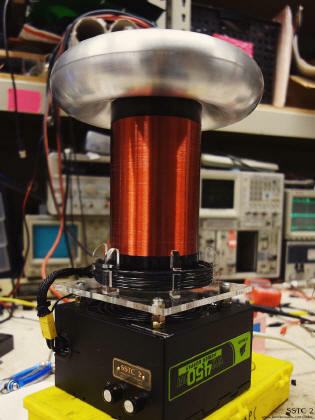 With the new primary coil, everything looks a bit tidier and spark length is now officially just hovering around 9 inches! It also breaks out happily without a super-sharp breakout point with no more secondary racing sparks and runs happily at 15A primary current. 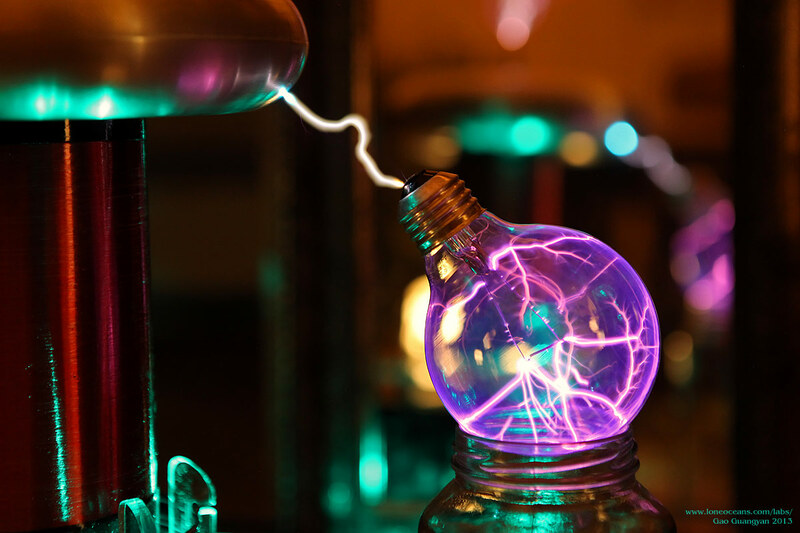 The coil also lights up big bulbs wonderfully with some very curious spark formation in the low-pressure environment inside a normal bulb. Finally, some overview photos of the coil in low frequency mode and higher pulse reps.
With Halloween just around the corner, I thought it might be a fun idea to try replacing the toroid with a pumpkin! I looked through a few supermarkets trying to find the right kind of pumpkin - around 8" in diameter, and quite flat, like a toroid. Unfortunately I didn't seem to be able to find any around, so I wound up buying a squash instead of a pumpkin. 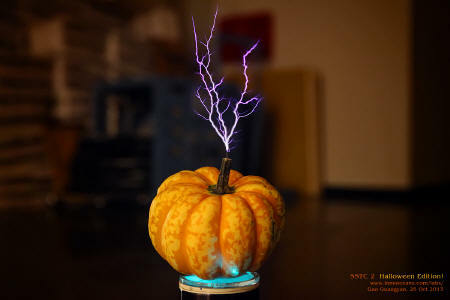 I then inserted two small wires at the top and bottom of the pumpkin, with the bottom connected to the secondary and the top as the breakout point. It works! The pumpkin (squash) works well as a toroid. Hopefully I'll find a more toroid-looking pumpkin another day. Happy Halloween everyone!